I really don't watch much Cable TV News since witnessing the 2008 Debacle in which the Media lifted Barack Obama past a more popular Hillary Clinton. So Fareed Zakaria was a first time revelation for me. Really a must watch 4 minute Editorial from the April 14, 2019 Sunday GPS show he hosts. The Borderwall will come back to haunt the Democrats in 2020 when it comes to the Presidency. Kirsten Gillibrand being Targeted by Conservatives to get her out of the 2020 Presidential Race. There are many more men than women running for the 2020 Democrat Presidential nomination. Kirstin Gillibrand seems to be the one being attacked at the moment. First it was Biden, now it is Gillibrand. Part of me is annoyed that the Republicans are going after a Woman Presidential Candidate when the Women are in the minority of Candidates. And yet, a Presidential Candidate has to be tough to weather all attacks. Gillibrand said Tactile instead of Tactical in a resent speech in regards to Tactical Nuclear Weapons. The mispronunciation of the word tactical is being used to try and socially humiliate her. However, I hope people see through the attempt and focus more on Gillenbrand's message that Tactile and Tactical Nuclear Weapons are a gateway to a full blown Nuclear War, and that matters way more than using the word Tactile instead of Tactical. Trump's plan to place The Undocumented in Sanctuary Cities was a Brilliant Political Move, but now we will hear Cries of Indignation from Pelosi, Democrats, and the Media. While Democrats accuse many in the Republican Party of being Climate Change Denialists, the same can be said about Democrats who curry favor with all by being for Sanctuary Cities, only to cry like Snowflakes when it is revealed that Trump wanted to place the Undocumented in Sanctuary City States. I am frustrated by a Democrat Party that stands for all the feel good things in life but then refuses to take responsibility for their stance. The proper response to Trump's plan in this instance would have been, "Bring it on, Mr. Trump, Bring it On". 800,000 Undocumented later and there would have been upheaval in many Sanctuary Cities. How can this Snowflake posturing continue to go on by Pelosi and the Democrats? Democrats need to find their own Kinder, Gentler, Smarter Version of Donald Trump for 2020, and also run Alexandria Ocasio Cortez as the V.P. The Donald Trump Presidential Romp reminds me of a Tank rolling along while a plurality keeps throwing empty beer cans and tomatoes at it. Meanwhile the Tank goes where ever it wants and does what it wants. In a slightly twisted way Michael Avenatti was right when he intimated that it would take a Trump type to beat Trump. The reason it will take a Trump type to defeat Trump is nobody on the Democrat side will give Donald Trump credit for anything, and the more Nancy Pelosi and Democrat Contenders try to pretend Trump is not President and that Trump is not to get his Border wall; not even a Lego Version of the Wall, the more Trump Supporters dig in, and the more likely that Independent and Moderate Voters will go for Trump in 2020. Trump continues to make miscalculations in the same vein as the Democrats. While the Democrats won't cede anything to Trump, Trump likes to stuff it down the Dem's throats whenever he gets the opportunity to do so. Trump's adrenaline induced latest gaffes after allegedly being vindicated in the Mueller Investigation include attempting to defund the Special Olympics, threatening to close the Mexican Border, defunding Central American Countries, while also not wanting to meet with Central American Governments after Trump had stated he would take away their U.S. funds. This is just not right and opens the door to having China, or Russia, or the Drug Cartel come in and provide some type of aid and support instead. Trump should care about Central America, but he doesn't. This may be the single biggest disappointment I have regarding Trump since he became President. Trump can't seem to muster Presidential interest where ever he has no personal business interests, a whopping Presidential Character Defect if ever there was one. I'd love to find a Democrat Trump, a Democrat who chastises all other Democrats for not congratulating Trump for winning in 2016, who chastises Democrat Candidates for not supporting Trump's Border Wall, a Democrat Trump who blames Hillary Clinton for not running one dollar a day Targeted Facebook ads the way that Trump's people did in 2016 as being the real reason Hillary Clinton lost to Donald Trump. A Democrat candidate willing to excoriate Bernie Sanders for misleading his followers about how Caucuses work and that Sanders was robbed of the 2016 Democrat Nomination. A Democrat Candidate who demands Democrat Politicians quit trying to find ways to avoid acknowledging the American Heartland, matters. A Democrat Presidential Candidate who campaigns that Trump is right about the Border Wall, but he just doesn't do enough other things right to justify Trump remaining President is the best person to defeat Trump in 2020. No Democrat will be able to beat Trump in 2020 if they don't have the backbone to complement Trump. And, the Democrat Trump should have Alexandria Ocasio Cortez for their V.P. I didn't realize Alexandria Ocasio Cortez was so old! She's already 29 and will be 30 well before the Presidential Elections, qualifying her for the Vice President Spot. I would then put Cortez in charge of finding a State that wants to go all in on her Green Deal and give her four years to get her Green Deal up and running in that one State as a test model for the rest of the country to see in action. Calling Nationalist's Racist is becoming the new Abnormal as Madam Secretary TV Show gets in on the Bandwagon Rhetoric. With each passing day Democrats harden their stance that their way is the only way, and all other ways are the wrong way, or, Racist Way. Meanwhile everyday the Media and Progressives wreak havoc on the concept of Nationalism. Even the TV show Madam Secretary came out strongly opposing Nationalism, calling Nationalism, Racism. Think about that for a moment. People of all races who are citizens of a country and believe in Nationalism, are now being called racist! If this level of pompous deceit continues, it's going to make me wonder if History has truthfully painted the events of World War II, a war allegedly funded on both sides by the rich elite of the world. What the Anti Nationalist's keep missing is the missing funds Nationalists feel have been siphoned away from long time U.S. citizens. 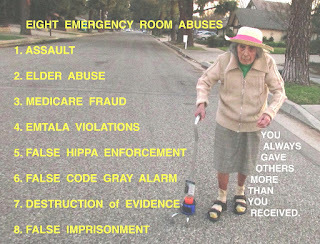 In the area of Medical Abuse by the system that deprives "Nationalist's" of earned Healthcare aid; the Anti Nationalism crowd is clueless in part because of HIPAA laws which prevent the truth from coming out about how seniors are being either deprived or mistreated by a Healthcare system that accelerates its tunnel visioned "Healthcare by Numbers" missive. And the older one is, the LESS rights they have to keep on living, I witnessed this ageist act personally. Miss you Mom, a 91 year old still walking 1.1 miles at a time with me by her side, victimized by a California Healthcare system that allowed her to be Abused in the ER by an ER Nurse and then Patient Dumped by the ER Curb, in the rain, to die at home, with no Police Investigation even when asked to on more than one occasion by her Caregiver son who had kept her out of an overnight Hospital stay for the prior 3 and 3/4 years. NBC News Exclusive: Comey Gives First Interview Since Mueller Completed Investigation, Comey Defends how the FBI turns non law violators are turned into Indicted Defendants. 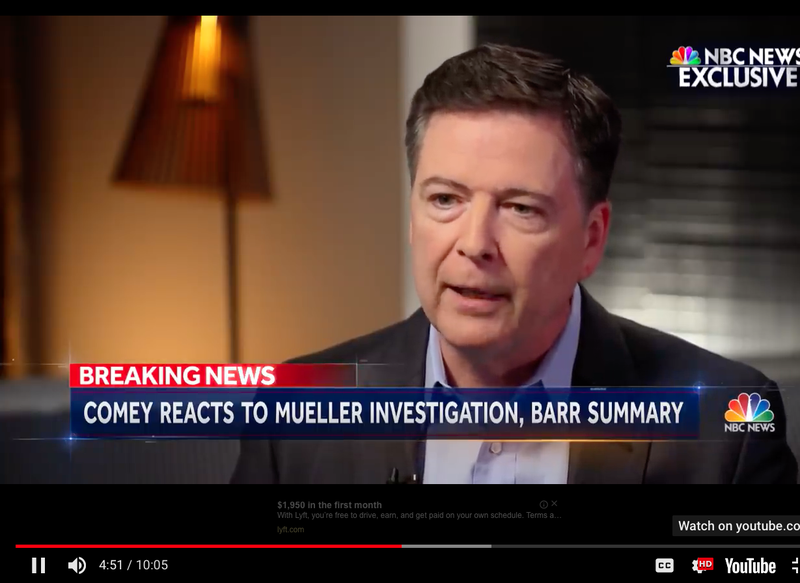 An intriguing part of the Lester Holt / James Comey Interview occurred when James Comey validated criminally charging people who had broken no laws but would not speak out because it might harm the reputation of others. Comey admits that the FBI forces people to answer questions that will devalue their place, or their families place, or their businesses place in society even if the activity in question did not break a law, wow. CLICK HERE TO GO TO 4MIN AND 51 SECOND STARTING POINT. Click here to go directly to 4 min and 51 seconds. Meanwhile, the FBI won't investigate Patient Dumping, aka a FEDERAL Law Violation called EMTALA that involves seniors and can lead to their death, as is what happened to my Mother at West Hills ER in Los Angeles CA. FBI Los Angeles did not even know what EMTALA was. So to conclude the Federal Bureau of Investigation won't investigate a Federal Crime against Seniors, but will indict innocent Americans who are not guilty of a crime, because they don't want to ruin the reputation of others who also have not have committed a crime, wow. Um, yes I would. When Bill Clinton was asked if he had sexual relations with Monica Lewnisky, it was an inappropriate question. The question should have been, did you have non consensual relations with Monica Lewinsky, Bill Clinton says "no", they ask Monica Lewinksy, she says "no", end of that line of questioning. Instead, Bill Clinton was basically forced into revealing a consensual act that did nothing to prove an illegal act. When Bill Clinton refused to divulge details of a consensual act, he was ultimately found guilty of lying about a consensual act. This is why these investigations don't get to anything, the investigators thrive on getting the person being questioned to lie about a legal consensual situation, the media runs it as earth shattering news, the FBI then hands out Indictments as if they accomplished something of importance, meanwhile my Mother's West Hills ER Nurse in my opinion broke several laws that DIRECTLY led to my Mother's death and no one in Law Enforcement from any agency would investigate. Collusion vs Consulting Confusion has Probably created a Mess of the Mueller Investigation. Defining Collusion as getting feedback or intel from Russia regarding a Presidential Election is most likely a double standard. If a Russian Politician wanted U.S. Help, I am presuming we would give it, and if found out, our government would state they were just acting as consultants. One day we make look back at the Russia Investigation as a McCarthy like situation in which admitting to interacting with any Russian Person meant violation of the law, a ludicrous Investigative Standard to be adhering to. And, what is even more ironic, making everyone afraid to even admit they talked or interacted with a Russian person just meant that nothing could ever really be uncovered that might actually lead to a third or fourth party collusion. I define collusion as actual Vote Tampering. Anything that actually disrupts or alters how votes are created, counted, tabulated, interpreted, or presented would be Collusion. Anything that prevents a person from having access to other political points of view could also be considered tampering. So if Russia had boots on the ground creating political voting flyers, or misrepresenting themselves as a political party and then doing something offensive that would harm the entity they were purposely falsely representing, that would be collusion. But if Russia GAVE Trump valuable intel on what Americans wanted or what would sway an American's vote, as long as the information did not involve or lead to fabricating lies or vote tampering, there is no Collusion, it's CONSULTING. There was such a rush to see if Trump or people from his administration consulted with Russia that apparently nobody bothered to differentiate Collusion from Consulting, and we are all the more mixed up and divided because of it. If Trump Pardons those indicted during the Mueller Investigation, the more salient point that the people indicted were being asked to admit to a crime that wasn't a crime, will be lost. Let's hope someone has the sense to challenge the Mueller indictments as being based on an incorrect interpretation and differentiation between consulting and collusion, call it what it was, Consulting/Collusion, Confusion. Gavin Newsom takes another page from the Trump handbook, will require that Potential Burn Areas be Raked, just like Trump suggested last California Fire Season. The Progressive Party is so out of control. Last Winter Season they ridiculed Trump for suggesting that raking the forests of dead brush and foliage could help reduce forest fires and how fast they travel. California Governor Newsom will be directing Border Patrol and First Responders to take pre-emptive action before 2019 California Fire Season starts, a pre-emptive action that will include the Raking of Dead Brush and Foliage, aka Dead Brush and Foliage Abatement. Wow. Gavin Newsom pulls a Donald Trump Border Wall Directive, Makes Personal Decision to stop all Executions. One has to wonder about the timing of Gavin Newsom's decision to cease all Executions and to Dismantle the Execution Room. Donald Trump is taking all kinds of heat for wanting to go forward with his Border Wall Funding. Meanwhile Governor Gavin Newsom does the exact same thing in regards to Capital Punishment. Will someone in the media at least acknowledge the timing of Governor Newsom's Mirroring of Trump's Executive Action? Republicans still have no clue just how devious California Democrats have become at diluting Senior Benefits and diverting the money to undocumented issues. So while Trump is excoriated for using his Presidential clout to declare a Border Emergency, Trump fails to tie the ends together in a bow that lack of a Border Wall is crippling California's Budget. Bribery Denied College for the More Deserving, but did it have to? Meanwhile 500,000 Annual Undocumented Dilutes California Senior HealthCare. There is a correlation between Bribery being a pathway to a prestigious College Enrollment, and 500,000 Annual Undocumented Eventually Resulting in Diluted Healthcare For California Seniors and higher taxes for all. Democrats refuse to admit that Trump is right regarding a Border Wall. California Democrat Politicians expose their own form of Bribery when they support compassionate issues in exchange for the votes they receive in return. These same California Politicians then conceal who is being hurt by their compassion, namely California Baby Boomers and Seniors through the Dilution of Healthcare programs so funds can be "redistributed" to Immigration related issues. As for the College Bribery "Scandal" it's sad to see every swallow the FBI's version of events. There is something else going on here that of much greater importance. Wow, AIPAC really does Run Congress. I have mixed feelings about Muslim Religious Influence on Politics in America. While I have trouble with any religion that forces its members to dress a certain way in public at all times, I recognize it's a way of being authentic and open about how they believe. The difference when Nuns do it is Nuns actually live separate lives because they are Nuns. Forcing a Hajib on women when in public seems to be a defiant reminder that there will aways be a difference between Muslims and others. In the case of Ilhan Omar's recent allegedly controversial remarks about Israel, I didn't see the remarks as being controversial since ALL lobbying groups use money to do their talking. Here is a review of the alleged controversy regarding Ilhan Omar's recent comments that have been overblown by politicians from both parties. Clearly AIPAC reaches into both parties, which is exactly the point that Omar was making. There is a lot of posturing going on among the Media and Politicians over Omar's remarks. The ironic part is, Sharia Law gives me the creeps, big time, bigly even. Yet in this instance Omar has been treated unfairly by all. Why did Trump's Associates lie about Russia when there was no reason to do so? Someday people may look back and wonder how the media created so much fear regarding talking to anyone from Russia among Trump's higher echelon associates. I am not understanding how consulting with Russia over the 2016 Presidential Election equals collusion. According to 60 Minutes, Trump might have won the 2016 Presidential because Facebook was literally at Trump's Headquarters educating members of Trump's campaign ad team on how to use Facebook Micro Targeting Ads during the 2016 Presidential Elections. Hillary Clinton refused to advertise on Facebook. If Hillary Clinton had matched Trump's marketing efforts on Facebook, she would have probably won the popular vote by at least 5 to 6 million votes and most likely also won the Electoral College vote. It seems like the Russia collusion bar has been lowered below ground level. As long as Mueller can show interactions between Russia and Trump's people, it will somehow mean collusion when the reality is it might just have been consulting work, just as Manafort, Devine and Stone did in Eastern Europe 10 years ago. Ultimately, Trump's personal drive to always be the winner is bad for what it mean to be President of the United States. Trump is ok with losing as long as publicly he can say he won, this is a very dangerous psychological trait to have as the President of the United States. But I agree the Border Wall is necessary to prevent the ongoing dilution of Healthcare Services in California along with the ongoing desire to create more and higher tax revenue streams in California. Just recently Democrat Presidential Candidates sided with the Striking Teachers in California. Now a new Parcel Tax is on the ballot in California to pay for smaller classrooms, a situation directly related to 500,000 undocumented coming into California on a yearly basis. So what may be called Russian Collusion, may actually be Consulting, and that concerns me, it should concern you as well. Hillary did an amazing job in 2016 considering she did have some health issues, was trying to keep Obama's coalition intact by not attacking Sander's per Obama's request. But Hillary Clinton probably chose to not surround herself with non yes people who could have given her cutting edge advice. Twice now Hillary Clinton was in part defeated by opponents who latched on to Media Disruptors. By not admitting she erred by not using Facebook Micro Ads, we may see another Trump term because Democrats are too focused on rewriting 2016 rather than reaching out to rural America, and agreeing that a Border Wall would curb undocumented entry and allow for America to Breath again without having to keep raising taxes to accommodate all within our borders. Seth Meyers confuses Collusion with Consulting. Seth Myers Confuses Collusion with Consulting. It's only collusion if actual ballots or votes were tampered with by Politicians or Russian Consultants. 06:18. the core question of Russian collusion. 06:22 of what the Special Counsel's office is investigating. 06:31. who the FBI thinks has ties to Russian intelligence. 06:37. while Russian intelligence was helping Trump win the election. 06:40. That is the definition of collusion. 06:41. If someone said, "I don't understand collusion." 06:43. Can you give me an example?" You could say that. Meyers is mixing up Consulting with Collusion. It's only collusion if actual voters or votes were tampered with. While a case could be made that if Russia paid for facebook ads to help Trump win, might be considered collusion, the problem is Hillary Clinton did no Facebook ads, and should have. If Hillary Clinton had done Facebook ads, and lost because both Trump and Russia were doing Facebook ads, then that could be seen as collusion by Russia. Unfortunately Hillary Clinton refused to do Facebook Targeted Micro Ads. It's like a golfer forgetting their putter, but because the other golfer was given golf clubs by Russia, the other golfer is disqualified. If Hillary Clinton had her putter, and still lost, then maybe make a case that Trump got help he was not supposed to use. But if Hillary Clinton did not put forward the logical counter move, then too bad for her. Take responsibility for not being able to be agile enough to understand the value of Facebook targeted micro ads. The bottom line, in my opinion, is Hillary Clinton would have won the popular vote by 5 to 6 million votes if she had done Facebook Targeted Ads. Steve Kornacki with Amazing Hardball Editorial from February 27, 2019 Explains Donald Trump to the Befuddled. Kept waiting for the Hardball February 27, 2019 episode so I could view Steven Kornacki's editorial close. Was unable to find just the Editorial only but I did manage to get a Transcript of it. Kornacki's Editorial explains Trump and his supporters exceedingly well. Kornacki only said his name at the very beginning of the Hardball episode, then. never said it again. I had never seen him before and didn't know who he was. Incredible how protective Chris Matthew's people are over not allowing a guest to even say his name or have it flashed on the screen. Best Educational and informative Editorial goes to Steve Kornacki while filling in on Hardball on the February 27, 2019 episode.